Sweeping across centuries and into the Aleutian Islands of Alaska's Bering Sea, And She Was begins with a decision and a broken taboo when three starving Aleut mothers decide to take their fate into their own hands. Two hundred and fifty years later, by the time Brandy, a floundering, trashy, Latin-spewing cocktail waitress, steps ashore in the 1980s, Unalaska Island has absorbed their dark secret—a secret that is both salvation and shame. 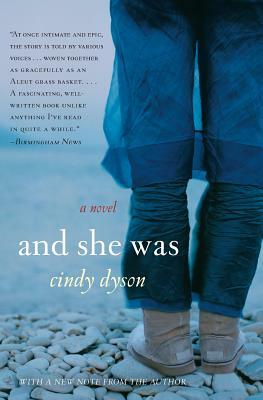 The author of eight books for young adults, Cindy Dyson grew up in Alaska. Her work has appeared in National Geographic, Backpacker, First for Women, Women's World, and other publications. She now lives near Glacier Park, Montana.